What are these old Muni cars doing in a town with a population of 398? 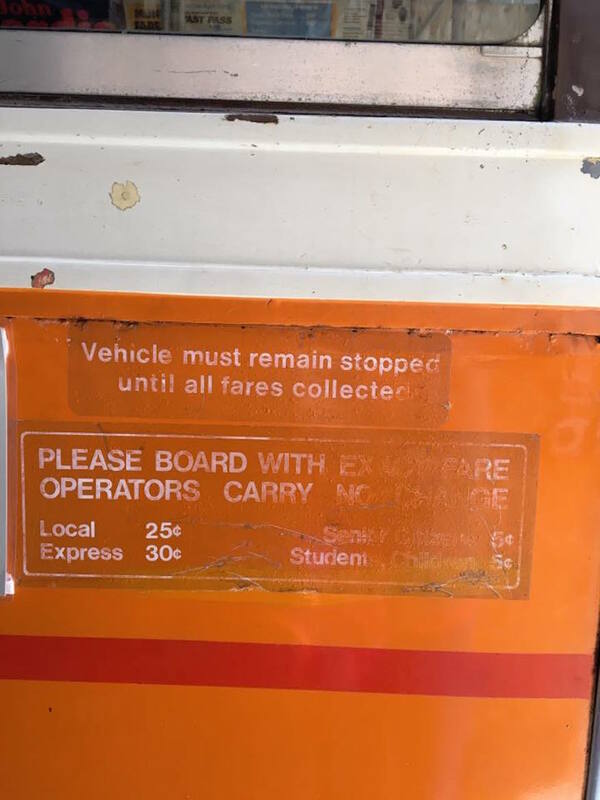 Jen Q. posted these photos in the San Francisco Remembered Facebook group when she went to the tiny town of Brooks, Oregon, and saw these vintage Muni cars on display. It turns out that the cars were a part of an exhibit at the Oregon Electric Railway Historical Society, thanks to some sleuthing from a commenter. And here comes reverse sticker shock: Do you know how much a Muni ride cost in the 1970s? Yup, look at this closely: 25 cents for a Muni ride. Anyone remember those days? For more memories of the city, check out the San Francisco Remembered Facebook group, where you can find “vintage photos, family stories, and memories of the City that we love,” all of it post-1906. Here’s something else we’d like to bring back from the 1970s: groovy BART uniforms! Those streetcars went into service in 1980. Very quickly, adult fares went from 25 to 50 to 75 cents and youth from 5 to ? to 25. Those LRVs didn’t last long. They were always breaking down. The Bredas are much more reliable. The specific problem with those cars was that they were manufactured by Boeing Vertol on the assumption that aviation design and maintenance principles were applicable to street cars (http://www.boeing.com/history/products/rapid-transit-car.page). The result were vehicles that were both too fragile and too difficult for streetcar mechanics to keep running. In response to the question about 25-cent Muni fares, I not only remember them, I remember printed Fast Passes that cost $11 per month. And when cigarette smoking was still permitted on Muni vehicles. Yes, that is what happened when Muni and Boston MBTA needed new streetcars, but there were no US companies with experience available to build streetcars. In my childhood and youth all fares were 5 cents. What’s the 30 cent express fare? Did there used to be N Judah Express service? Wow, what a cool find Jen Q. thanks for the fun snapshots. In 1978 I moved to S.F. from Los Angeles to finish college and was impressed enough by MUNI that I sold my car. Compared to L.A.’s hilariously mis-named Rapid Transit District (now LAMTA) MUNI was a “real” transit system I could use every day. Both my future wife and I rode cable cars on the route to and from school. All this for 25 cents! The PCC streetcars were a hoot – they were smooth riding, quiet, but obviously rolling antiques just a step newer than the cable cars. It felt like a step into the future when the Boeing Vetrol cars arrived. To me, BART and MUNI comprised an amazing, world class systems. But then I started travelling overseas. A Boeing car can also be found at the Western Railway Museum at Rio Vista Jct., CA. 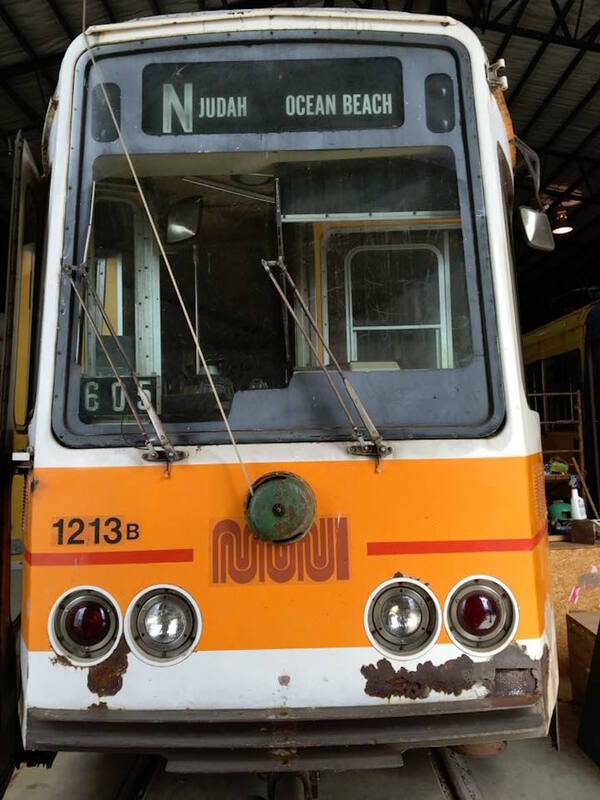 Muni car 1213 was one of two test cars (the other was 1212) used to check out how they would run on San Francisco streets and had both trolley poles and pantograph. The two even ran down Market St. during the first Trolley Festival in 1983.